It was great fun watching thugs slash and bash each other in the Korean film "Nameless Gangster" at CGV Cinema in Koreatown. Rice, meat, vegetables, egg (cooked crisp, the way I like it, by the hot stone bowl) and a salad on top, all tossed with spicy sauce, a perfect pre-Korean-movie dinner. Otherwise it would have been frustrating to watch the gang guys eye each other over what looked like very tasty meals. 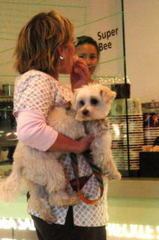 The restaurant, MaDang 621, is right below the theater in Madang Plaza on Western Avenue. It's so stylishly Korean that you think you're having dinner followed by a show in Seoul. The menu includes several versions of bibimbap, including a cool one topped with raw beef (above). Barley tea and a few banchan came with the meal. The sweet rice drink sikhye, with a couple of pine nuts floating on top, followed. For my taste, that's better movie food than popcorn, nachos and a soda. MaDang 621, 621 S. Western Ave., Los Angeles, CA 90005. Tel: (213) 384-2244. "You are traveling to '70s Korea in a time machine," said my Korean friend as we ate at Zzamong on West 3rd Street in Los Angeles. A Korean-style Chinese restaurant, Zzamong is like the old fashioned neighborhood family restaurants she remembers from home. 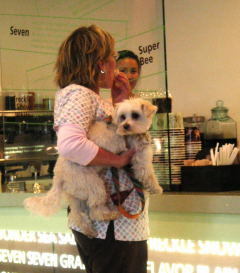 Its ambitious menu of 70 dishes has been whittled down to half that size, retaining only what customers really like. At the top of their favorites is the noodle dish jjajang-myeon. Kids love it because the dark sauce looks like chocolate and because they can laugh at each other when the sauce dribbles onto their faces. The dark color comes from caramel and black bean sauce, not chocolate. At Zzamong, the English name is Peking noodle, and there are three versions. The most elaborate contains seafood (above), but pork is more traditional, my friend said. The typical garnish is sliced cucumber. Often this would be the only dish a Korean would order. If the occasion called for something more, the typical choice would be sweet and sour pork (right). 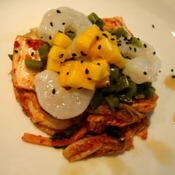 Zzamong's version is nothing like the usual Chinese-American rendition of this dish. The only additions are onion and cucumber, no pineapple, bell peppers and catsup. The meat is thickly battered and very crisp. The sauce is clear, thick and sweet. Because the food is Chinese, banchan do not accompany meals. 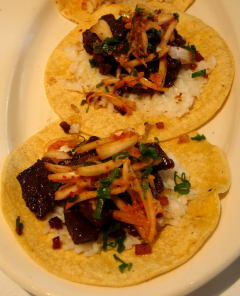 You do, however, get three small side dishes--cubed radish kimchi, onion and yellow pickled radish. The Korean way is to sprinkle vinegar over the radish and onion and dip the onion slices in a small dish of thick black sauce. 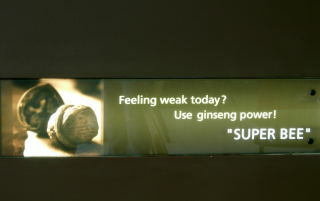 Although tea in some form usually comes with Chinese and Korean meals, the only drink provided at Zzamong is water. Zzamong Chinese Restaurant, 4255 w. 3rd St., Los Angeles, CA 90020. Tel: (213) 739-2747. What's in it? Soju, Korean black raspberry wine, soda, ice. What's it like? Lightly fruity, not sweet, pretty color, perfect for the end of what was an overly hot week. Where was it served? The home of the Korean consul general, Kim Jae-Soo. The occasion? A reception and dinner celebrating the national day of the Republic of Korea. Any other good drinks? Unfiltered rice wine flavored with green tea. What else was notable? Non-stop food. For appetizers, smoked salmon and kimchi quesadillas, spicy shrimp shooters, mung bean crab cakes and seared tuna with lemon soy sauce vinaigrette. Dinner included almost anything Korean you could want to eat, such as barbecued beef, barbecued pork, braised beef, chicken and vegetable skewers, shrimp with mung bean pancakes, bibimbap, chap chae, lots of kimchi and Korean sweets, like rice cakes, dried persimmon rolls, chewy sesame cakes and the sweet rice drink sikye. Who did the food? Banchan a la carte Catering. Banchan founder Jayne Chang worked the buffet lines along with the servers. Entertainment? Korean classical music and dance. What was unique? Bach's Sinfonia 15 adapted to traditional Korean instruments by the fusion group Ye:rak. Anything else? Perfect weather for partying outdoors in a beautiful setting. Western classical music played by a string group accompanied the reception and dinner--really classy. Eating 40 dishes in a couple of hours wasn't as tough as it sounds. And the goal was important. The Korean government wants to make Americans more aware of Korean food and arranged the tasting in order to test reactions to a wide range of dishes. Asked to judge were food writers, restaurant chefs and managers, cooking teachers, media people, representatives from Asian organizations and other Asiaphiles. The place was Yong Su San in L.A.'s Koreatown. And the program was directed by Sook-Ja Yoon of the Institute of Traditional Korean Food in Seoul (at right). A lot of work went into this. The portions were (fortunately) so tiny that later I was hungry. But they were garnished carefully, to appear at their best. That rated applause, but we were a tough group, and our checklist allowed us to say if we really disliked anything, disliked it just a little or thought it was only fair. The food ranged from traditional, such as bulgogi, cut into fine shreds to give it a new look, to fusion to light, delicate things that I suppose would appeal to Americans scared of foreign cuisines. A chicken and kiwi salad could have turned up at Spago and no one would have guessed it was Korean. But altering Korean food to please the American palate (whatever that is) isn't a good idea. Take out the kochujang, fermented soy bean paste, anchovy broth, garlic, kelp and hot red peppers in favor of pretty, bland tastes, and you lose the soul of the food. We already have Thai stir-fries full of bell peppers, Mexican plates smothered in cheesy sauce and Peruvian ceviches that are actually Mexican. Just imagine lightly spiced cabbage slaw masquerading as kimchi. On the other hand, Korean restaurants could offer a greater variety of dishes. But taking chances can be risky. That is why owners of Mexican, Indian, Thai and other ethnic places stick pretty much to what they know is acceptable. At the tasting, we ran across some odd things, like kimchibap pizza. That was a mound of kimchi fried rice topped with shreds of cheese--no crust underneath. Noodles with pine nut sauce and seafood would have been delicious, if you were in an Italian restaurant. But traditional, lightly sweetened pumpkin porridge was a hit. Rice with fresh herbs and delicate pine nut sauce was lovely. Gelatinous knuckle bone and vegetable salad was first-rate. Squash stuffed with ground shrimp and pan fried was another winner. And broiled chicken with garlic and mango was delightful, although not very Korean. At the end, we were asked to paste red dots on a chart to indicate our three favorites. Although I don't care for tofu, I had to choose dubu (tofu) steak. That single compact bite of tofu mixed with pork and circled by a ring of fresh onion was perfectly seasoned. And the contrast of meaty with crunchy onion made it stand out. Another top choice was prepared by Sook-Ja Yoon herself. She had blended tofu with mango, peach and kiwi for a richly creamy sorbet. 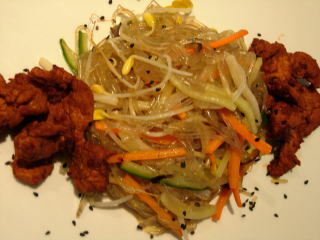 My third choice was andongjjimdak--braised chicken wings with sliced pumpkin (kabocha) and sweet potato starch noodles. I want a recipe for that one. At the end, we toasted each other with makgulli, a tangy, milky rice wine. Having valiantly worked our way through so much food, we felt we deserved to celebrate. The sign above Namsan Restaurant and Fusion Cafe says "Grand Opening," but the place isn't really new. 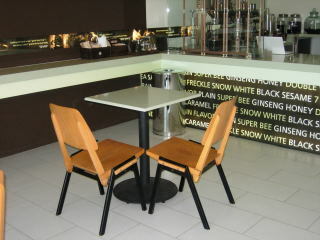 A coffee house before, it has now added a menu of Korean dishes to its repertoire of teas, lattes, frappes and smoothies. As for fusion, perhaps that was the curry bul gogi I had for lunch--sweet grilled beef on a sizzling platter with just enough curry to leave a yellow stain on rice but not enough to intrude on the flavor of the marinade. Namsan is like that, understated and, to use a word that comes repeatedly to mind, sweet. Small but open, bright and fresh, it has a broad white communal table, circles of color on the wall, fresh flowers and cute clear plastic pitchers that dispense tea when you set them on a cup. The hostesses (servers is too graceless a word in this case) seem to care that you are there. I happened in a few days after the new menu debuted. At noon, I was the only customer, but Namsan is open all night, and, I figure, attracts a late crowd. The cook had little to do and so sat in the restaurant, perhaps checking to see what I thought of her food. Not to worry. Lunch was very good, with housemade kimchi and other banchan, a salad, pale white beef bone soup and rice in addition to the meat. All that for $8.95. The soup was mild and unsalted--by design, I think. It was soothing to eat after such highly seasoned banchan as spicy bean paste with a crunchy fresh green chile and cool plain cabbage. In contrast, the subtle meat flavor became more apparent. Other small plates held spicy marinated radish, seasoned spinach. 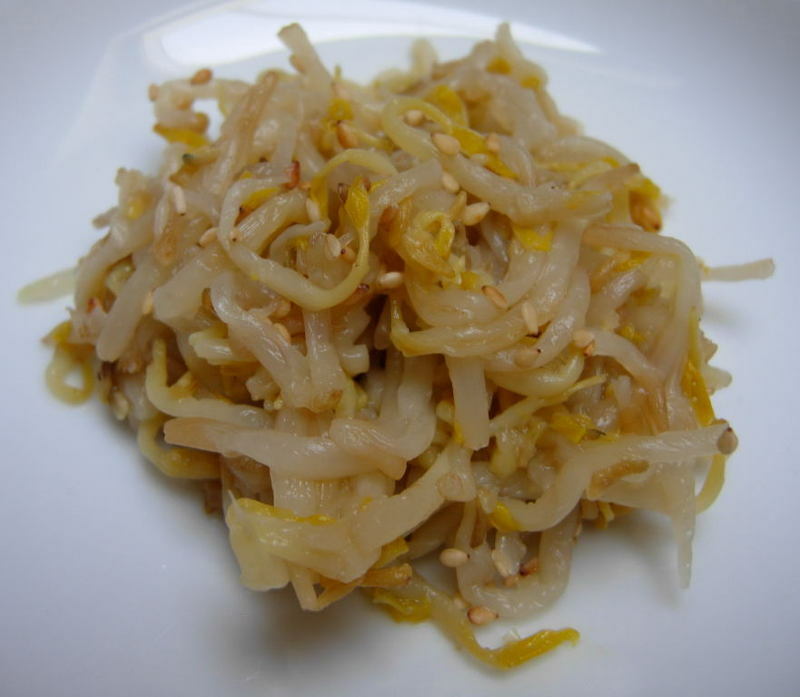 bean sprouts and squid. The long list of main dishes includes bibim bap, chicken ginseng soup, grilled chicken with "extremely hot" sauce, baby octopus with pork belly, soybean sprout soup, abalone porridge, noodles and kim bap, which is Korean style sushi. Enough, in other words, to inspire repeated visits. Namsan is one of several small Korean eating places in a mall at the corner of 6th Street and Normandie Avenue. If you pass by at 5 a.m., you can drop in for a bargain ($4.99) Korean breakfast. A late sleeper? Don't worry. The breakfasts continue until 10 a.m. The morning menu posted on the wall shows typical Korean dishes. Most are identified in Korean only, but one picture includes a breakfast specialty that anyone could recognize--toast. Namsan Restaurant and Fusion Cafe, 3613 W. 6th St., Los Angeles, CA 90020 (corner 6th and Normandie Ave.). Tel: (213) 382-7777. Open 24 hours daily. Eggs benedict and Champagne may be your idea of Sunday brunch. But I'll take abalone porridge and barley tea. This Korean rice porridge (juk) is the perfect way to ease into the day, as good a weekend restorative as Mexico's menudo. It's light and delicate, just bits of abalone mixed with soft rice, an egg on top and a few strands of seaweed. The place where I tasted it, The Oxford Palace Hotel's Take Sushi Restaurant in Koreatown, is perfect for brunch too. The room is quiet and coolly elegant, set off by bamboo-etched glass panels that surround the center tables and give a sense of privacy to the outer rim. The table linens are dark green and pale blue, colors that aren't jarring, if you've celebrated too much the night before. But if you can stand more of a jolt, there are plenty of spicy dishes on the Korean side of the menu, and you can pep up the porridge with sauce from these. That’s what I did with “black codfish braising” (eundaegu jorim), a succulent dish of tender fish and translucent radish in spicy sweet red sauce. My friends were hungry for Korean flavors, so we skipped the Japanese side of the menu to order such standards as barbecued prime short ribs (galbi) and dolsot bibim bap (mixed rice in a stone pot), then veered into a less familiar stew (jjigae) of pollack roe and vegetables. This soupy, spicy dish was interesting and generous with roe, but the roe had been overcooked and so was dense and dry. It was fresh, though, and the vegetables, including enoki mushrooms, were nice. Standouts among the five or six banchan were very fresh kimchi and spicy-sweet squid strands so delicious that I asked for more. The kitchen sent out a first-course salad—lettuce and cucumbers with a citrus flavored ground topping. And we finished with a plate of fruits that had been cut and arranged with care. The restaurant offers something for every taste, from teriyaki to a $120 sashimi platter and an $80 sushi and sashimi combination for a well-heeled individual at the sushi bar. The abalone porridge is at the lower end of the price scale, $11.95, or about $3 a person if you take into account that it was large enough to serve four. Take Sushi Restaurant, Oxford Palace Hotel & Galleria, 745 S. Oxford Ave., Los Angeles, CA 90005. Tel: (213) 389-8000. Open daily from 7 a.m. to 3 p.m. and 5:30 to 10:30 p.m. This is the most unusual taco that I have ever seen. The base is a yellow corn tortilla, no thing different about that. But the meat on top is galbi chim, which is Korean style braised beef. What looks at first glance like chopped onion under the meat is white rice. And those fine shreds on top aren’t the usual cabbage or lettuce. They’re the Korean cabbage pickle, kimchi. This and two other Korean-Mexican dishes won first prize in a Korean fusion cuisine competition staged by the Korean Cultural Center of Los Angeles on Saturday. 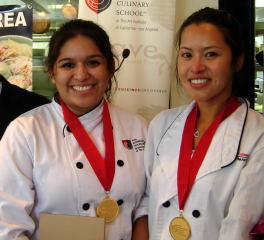 The contest took place at the International Culinary School at the Art Institute of California-Los Angeles, which is located in Santa Monica. Competing were 18 students, divided into nine teams of two. Each team prepared fusion versions of three Korean dishes: kimchi salad; japchae (clear noodles with meat and vegetables) and galbi chim. Entries were judged on flavor, texture, presentation and creativity as well as technical factors such as doneness and timing. The winners were Crystal Lozano of North Hollywood (at left in the photo below) and Sharon Widjaja of Jakarta, Indonesia. As their prize, they’ll go to Korea for a week of intensive food study. For their salad, Lozano and Widjaja topped kimchi with diced cactus, shrimp ceviche and cubed mango. They made classic japchae, but flanked it with pork marinated in ancho chile sauce. 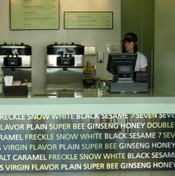 “We wanted to keep all the Korean flavors, but present them in a Mexican style,” Lozano said. Competitors brought their plates to the stude nt-operated restaurant Bistro 31 for display and a reception that included traditional Korean music and demonstrations of rice-cake making and the Korean tea ceremony. Students not competing prepared a Korean lunch for the teams, judges and guests, putting as much effort into flavor and presentation as if they were working for a prize. They set out bibimbap (rice bowls), spicy pork ribs, mung bean pancakes, mushroom japchae and bulgogi (grilled marinated beef) placed on a shiso leaf lining a lettuce leaf, accompanied by Korean citrus punch and a cinnamon-flavored persimmon drink. Lunch ended with fresh fruit and prettily decorated rice cakes. Winners all, as far as I’m concerned. Talk about consuming passions. No, not the usual man-woman thing, but a deliciously spicy passion, an intense addiction, an ecstatic love gratified morning, noon and night with—kimchi. I’ve not met anyone with more devotion to this fiery hot, garlicky Korean pickle than my friend Clark Akers. Not even the Koreans I know speak of it with such awe. Clark always had kimchi on hand at home. He would eat it for breakfast with bacon and eggs, at lunch with a sandwich or soup and at dinner instead of a salad. He adored it so much that I think he would have eaten it even with apple pie. When we would meet for lunch in Koreatown, Clark would demolish all the kimchi that came with the banchan, ask for more, then order more to go. One of the highlights of his life was when a Korean friend brought him a jar of his mother’s homemade kimchi. Clark has now moved on to other realms where, I hope, the kimchi is as heavenly as he deserves. I never eat Korean food without thinking of him, and I prize the one tangible memento that I have—his recipe for kimchi soup. Clark brought me a taste one day, and it was as good as he claimed. Luckily, I asked for the recipe. Here it is, in memory of my friend, Clark Edgar Akers. Place the water in a large saucepan and set aside. Cut the carrot in half lengthwise, then crosswise in ¼-inch slices. Cut the celery stalk in half lengthwise, then crosswise in ¼-inch slices. Quarter the bell pepper lengthwise, then cut crosswise in ¼-inch slices. Add the carrot, celery, green onions and bacon to the saucepan of water. Bring to a boil, then boil gently, uncovered, 15 minutes. 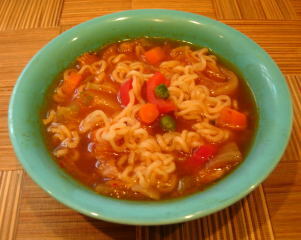 Add the bell pepper, peas, mushrooms, the bouillon cube, the ramen noodles and their seasoning. Cook 3 to 4 minutes. Add the kimchi and cook until heated through, about 2 minutes. Makes 4 side dish servings or 3 servings as a main dish. Getting invited to a home-cooked Korean dinner is a rare honor any time. But this night, the main dish was to be one of my favorites--kalbi chim, a succulent, slightly sweet and irresistibly good dish of braised beef ribs. My friend Sejung Kim had offered to cook. 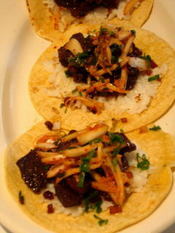 Knowing how much I like kalbi chim, she had consulted with Seong Yeon, a friend in Seattle who is expert at this dish. The ribs, rice and a salad would have been enough, considering that it takes three days to make kalbi chim properly. But no. Sejung cooked everything else she could think of to make an extraordinary Korean meal. The food was beautiful, like art work. Just one example—kamja bokkeum, strands of potato and bell peppers woven into an artful design. We started with a soup. 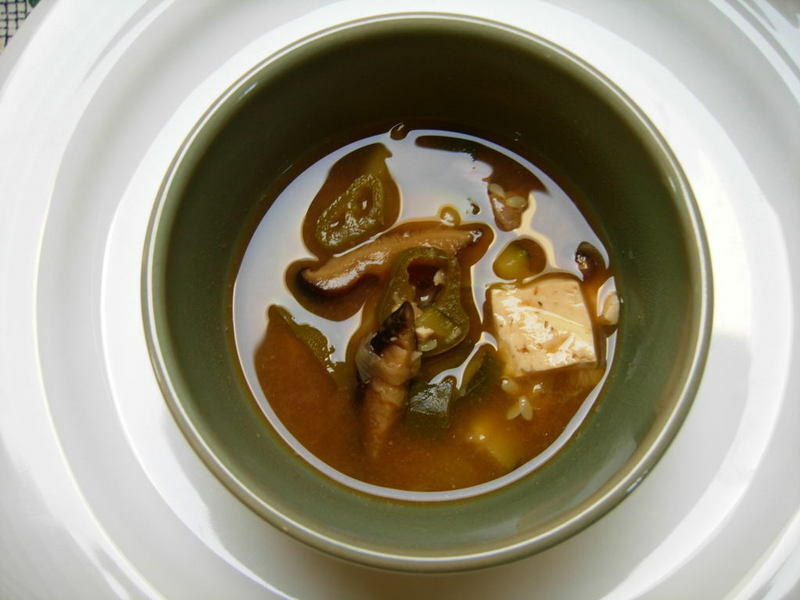 toenjang jjigae, based on a delicate broth made from anchovies and kelp. Into this, Sejung had put cubes of beef and potato, tofu, zucchini, shiitake mushrooms and onions. And of course toenjang, which is fermented soy bean sauce--Korean miso. 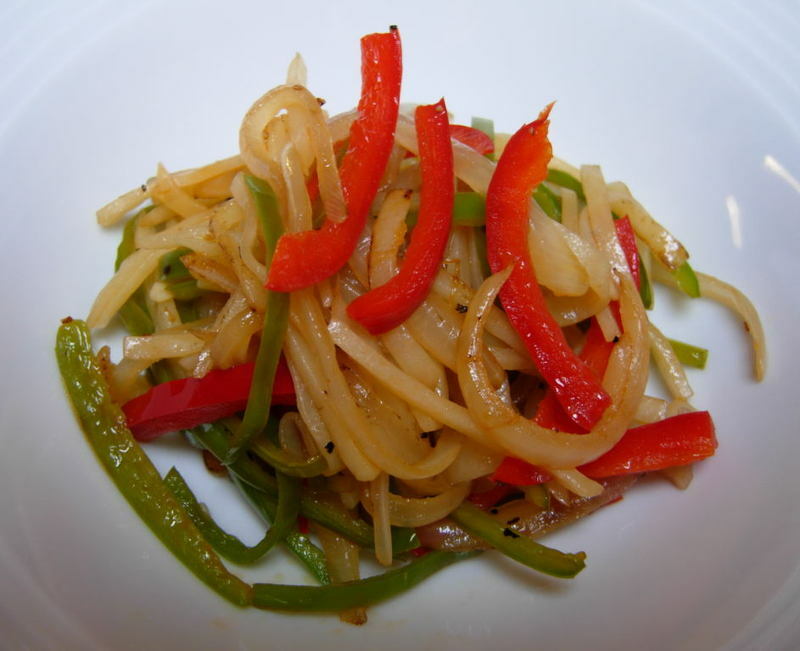 Most Korean restaurants serve marinated bean sprouts, sukju namul, and Sejung had made them too, seasoning the blanched sprouts with rice vinegar, sugar and sesame seeds. We also ate dried young fern shoots (kosari) in an appetizing blend of soy sauce, sesame oil, sesame seeds and green onions—basic seasonings for much Korean food. 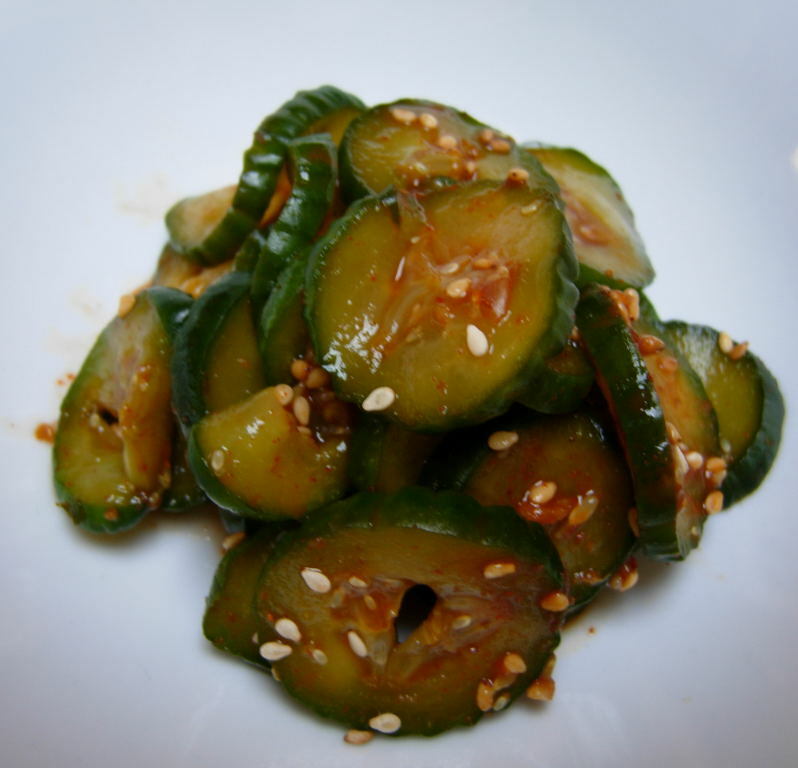 There were sliced Persian cucumbers marinated with spicy red pepper paste (kochujang), garlic and sugar. 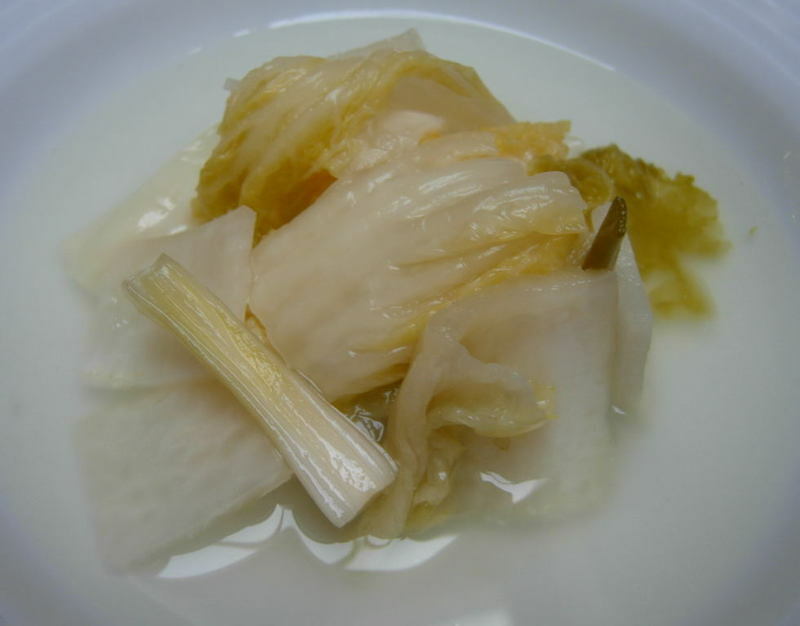 And white kimchi, mild and delicate rather than spicy with red pepper. 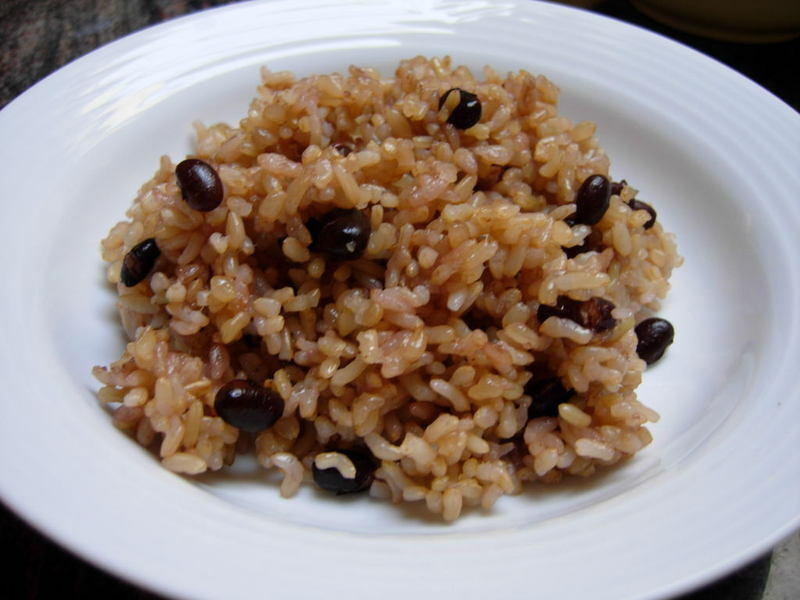 Plain rice would have been fine, but Sejung had made an ornate dish of short grained white rice combined with both sweet and regular brown rices and black beans. 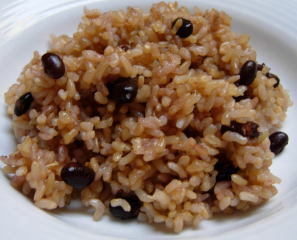 This is called kongbap, kong meaning beans and bap cooked rice. The vegetable dishes may sound simple, but some of them required hours of preparation. The kosari for example, had to be soaked, rinsed, boiled, soaked again, then sautéed. 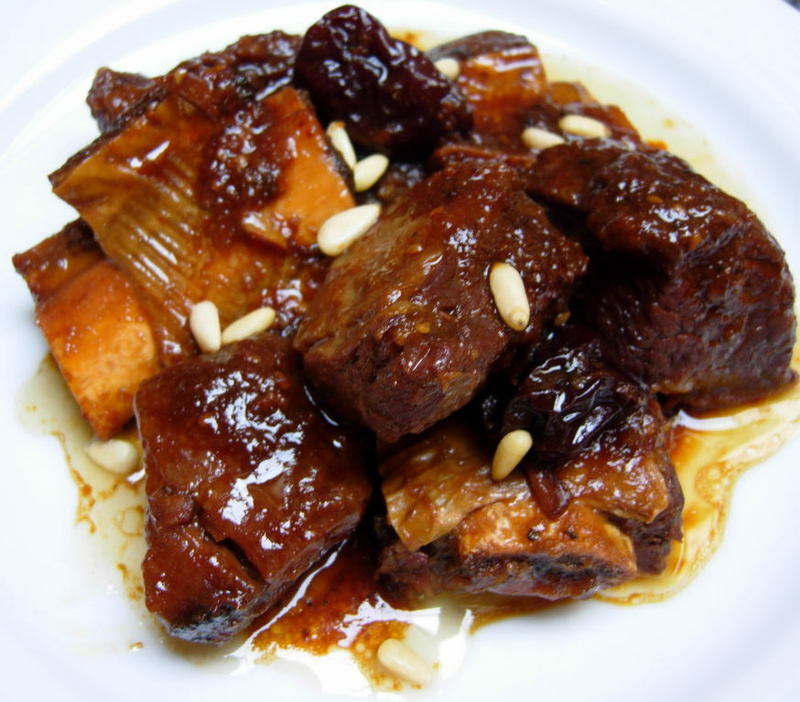 The highlight, of course, was the kalbi chim (sometimes the dish is spelled kalbi jim, kalbi tchim or galbi jjim), ornamented with Asian red dates and chestnuts, and sprinkled with pine nuts and hairlike strands of dried red chile, called silgochu. In Korean restaurants, I usually drink Korean beer, but Sejung likes Sangiovese or Shiraz with Korean food, and by chance I had brought along a Mosby Sangiovese 2004. 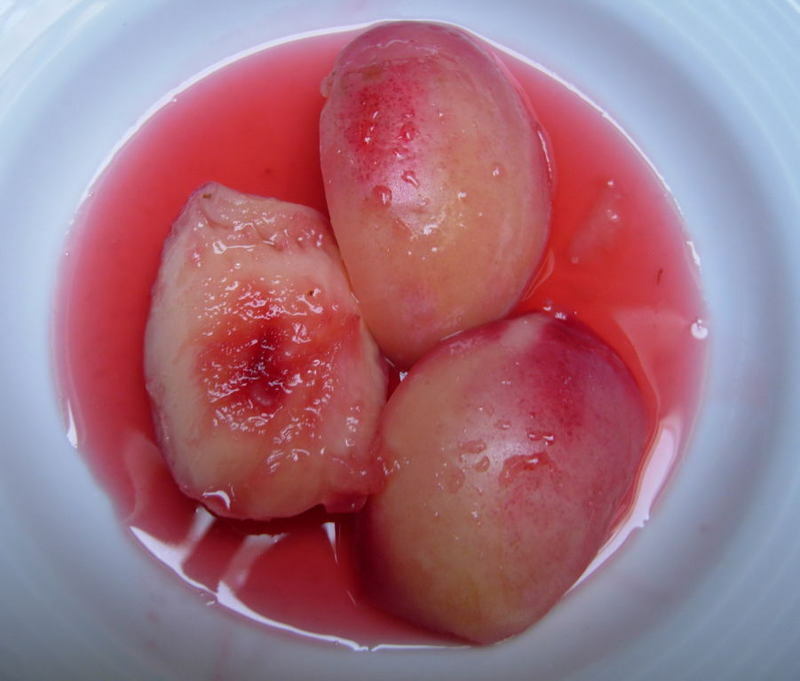 We finished with fruit, a pretty dish of white nectarines in syrup flavored with white Zinfandel. The following weekend, with the taste of kalbi chim still fresh in my mind, I went to a Korean market, bought the ingredients and started the three days of preparation. The results were sumptuous. The procedure isn’t as difficult as it sounds. Much of the time is devoted to marinating the meat to concentrate the rich flavor. The kalbi chim that Sejung makes is far from “standard” though. Its intricate flavors and painstaking preparation place it on a level that, as far as I’m concerned, is in the stratosphere. Start the preparation 2 days before serving. On the first day, place the ribs in a large bowl or dishpan and cover with cold water. Let stand 2 hours. Drain the ribs, rinse and pat dry with paper towels. Place them in a container with a lid. Grind the pear in a food processor or blender. Combine the pear, sake and sugar with the meat and mix well. Cover and marinate in the refrigerator 1 hour. Combine the soy sauce, onion, green onion, garlic, sesame oil and sesame seeds in a food processor or blender and process until pureed. Add to the meat. Mix well. Cover and refrigerate overnight. The next day, place the meat in a Dutch oven. Add ½ cup water, cover and bring to a boil. Add the ginger root slices. Reduce the heat, cover and cook over medium low heat 3 hours. Meanwhile, soak the dates until softened enough to slit them and pry out the seeds. After 2 hours, add the seeded dates and the dried chestnuts, if using, and cook 1 hour longer. Let the meat cool. If any bones have separated from the meat, remove them and discard. Return the meat and cooking juices to the washed storage container. Cover and refrigerate overnight. The next day, remove as much of the congealed fat from the meat as possible. Turn into a Dutch oven and reheat to serving temperature. Transfer the meat and juices to a large heated serving container. Sprinkle with pine nuts, and with dried red chile strands if you are bold.